Devil’s Claw, a traditional joint-supporting herb, has been used in Africa and Europe for more than 350 years as an herb for flexibility. 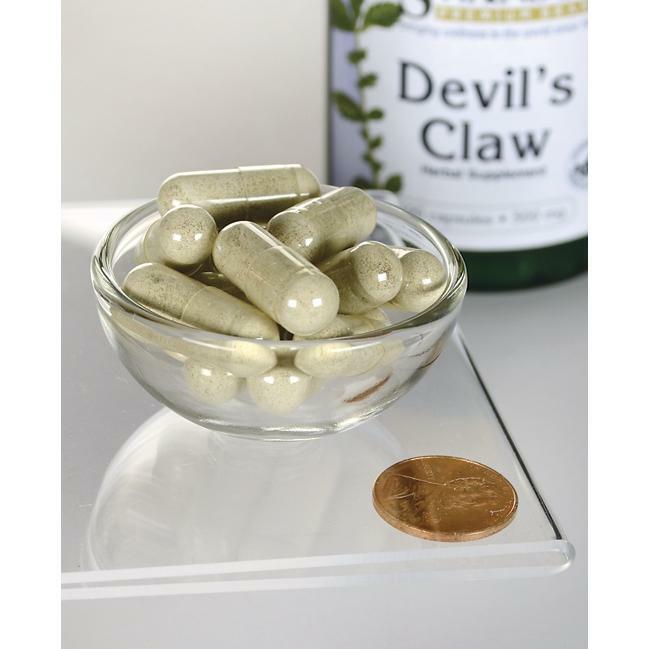 * Swanson Devil’s Claw delivers 500 mg of this effective herb in every capsule. WARNING: Do not take this product if you are pregnant, nursing or if you have or have had ulcers or gallstones. Consult your healthcare provider before use if you are taking a blood-thinning medication. The German Commission (a committee made up of scientists, toxicologists, doctors, and pharmacists formed by the German government in 1978 to find out if herbs sold in Germany are safe and effective), has approved Devil’s Claw for use in rheumatic and arthritic conditions. Devil’s Claw benefits aren’t just limited to hip and knee pain, studies have also shown that it can help back and neck problems too. Known as a powerful digestive tonic, the flavonoids and phytosterols found in Devil’s Claw are antioxidant, choleretic (stimulate bile production) and antispasmodic which help to maintain overall digestive health. It can provide considerable relief from heartburn as it soothes the inflammation caused by acid reflux. Devil’s Claw can also help in relieving the symptoms of an upset stomach by suppressing inflammation of the stomach. In a study conducted at the University College of Cork in Ireland, it was shown that Devil’s Claw can slow down or even stop the production of the “hunger hormone” ghrelin. This herb may be useful for weight loss in suppressing hunger pangs if overeating is a problem, and could make it a promising treatment for “Binge Eating Disorder”. In fact Devil’s Claw is now being investigated for its use as an anti-obesity treatment. The plant itself lives in very harsh conditions and stores many nutrients and moisture in the roots which makes them fat and phyto chemical rich. The San Bushmen prepare a tea from the fresh root which they drink regularly. Some anthropologists have observed that you hardly ever see any of the San people hobbling and attribute this to the amount of Devil’s Claw that is consumed.